Friday’s Kuspuk, one pattern with many options. Sized 2-32 to fit most teens and adults. 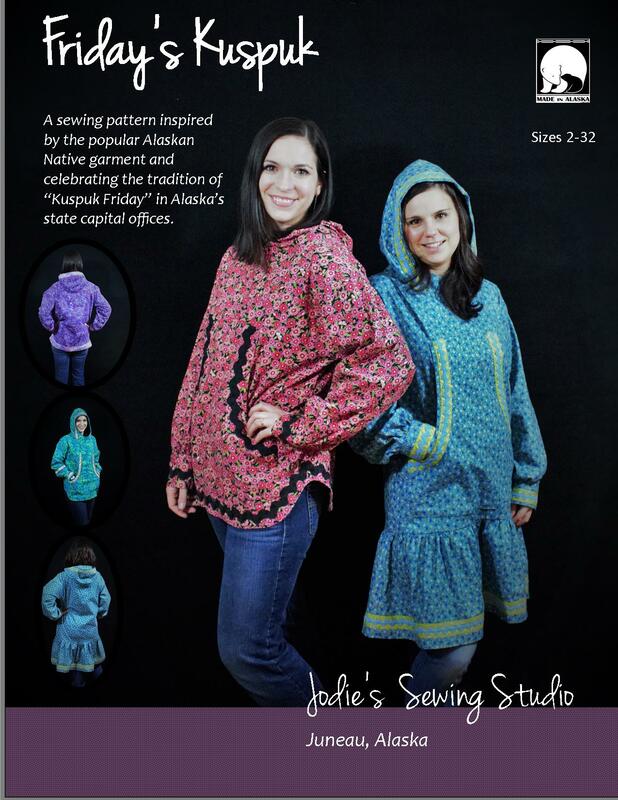 The pattern is currently available at the following Alaskan retailers: Raintree Quilting of Juneau; Changing Tides of Juneau; Seams Like Home of Anchorage; The Quilted Raven of Anchorage; The Quilt Tree of Anchorage; Sylvia’s Quilt Depot of Wasilla, Whale’s Tail Quilt Shop of Ketchikan; Tenakee Market of Tenakee Springs; the Rushin’ Taylor of Skagway; Abby’s Reflection of Sitka; Kenai Fabric Center of Kenai; Sew Far North of Nome; Northern Threads of Fairbanks; The Material Girls of Fairbanks; and Sew’n Bee Cozy of Seward. The “Kuspuk” itself is not my design. It is a beautiful part of Alaska’s clothing heritage. The Kuspuk (from Yup’ik qaspeq; Iñupiaq: atikłuk) , also known by some as the “Eskimo Summer Parka”, was traditionally constructed of calico fabrics and adorned with simple trims such as Rick Rack and bias tapes. Traditional Kuspuks are not made with a “pattern” such as this but with custom torn pieces of fabric and artfully crafted to fit the individual wearing it. If you ever have the opportunity to learn from a native teacher, do so. The garment has been used as a protective (and decorative) outer garment over winter parkas and as a lightweight top or dress in the summer months. Kuspuks are great bug barriers! Kuspuk designs vary across the state, reflecting the uniqueness and beauty of Alaska’s Native Peoples. In Juneau, Alaska’s beautiful capitol, state office workers wear Kuspuks on Fridays. These days are known as “Kuspuk Friday” ….. hence, “Friday’s Kuspuk.” I’ve been making Kuspuks for 28 years. I love them. My favorite style is the simple pullover, Alaska’s original Hoodie!!! I’ve taught sewing for years to teens and adults. Years of teaching adults how to alter patterns to fit has had a great impact on the design of this particular pattern. The Kuspuk itself is a rather simple garment and I tried to preserve that in this pattern. It is a loose fitting pullover with a simple shirt (not set in) sleeve. Friday’s Kuspuk pattern is sized from 2 to 32 in one ready-to-use pattern. The smallest size fits young teens. I drafted the pattern then had it entered into pattern cad software for sizing purposes. I contracted with a grader for this. The multiple sizing is beneficial for many reasons. It’s most beneficial for larger sized people who often need a variety of sizes in one garment. For example, one friend of mine needs a size 26 bust, 30 hip and 16 wrist. Adjustments are quite simple in a multi-sized pattern. Please contact me if you have any questions, especially if you have questions regarding using your multi sized pattern.